Non-medicinal ingredients: potassium nitrate (providing 259 mg nitrates), green tea extract, citric acid, maltodextrin, silicon dioxide. Capsule: hypromellose. AOR Guarantees: that no ingredients not listed on the label have been added to the product. Contains no wheat, gluten, nuts, dairy, soy, eggs, fish, shellfish or any animal byproduct. Nitric Oxide has the remarkable ability to enhance the action of a substance with which it shares similar effects. 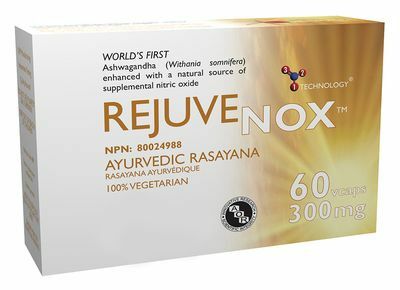 Both ashwagandha and Nitric Oxide found in RejuveNOx promote relaxation, thus creating a supercharged ashwagandha. Ashwagandha is one of the most revered and widely used plants in traditional Ayurvedic medicine. Also known as Indian ginseng, it is considered a rejuvenative tonic or adaptogen. RejuveNOx not only promotes the best of both worlds by delivering the combined benefits of both ashwagandha and Nitric Oxide, it is more effective at a smaller dose. Primary Uses: Ashwagandha is a natural adaptogen that helps the body to cope with stressful situations. It improves stress tolerance and helps to restore and maintain the body's energy levels during stress, thereby reducing fatigue and exhaustion. Ashwagandha has also been shown to increase and maintain Nitric Oxide levels in the body. The body naturally produces more Nitric Oxide when it is relaxed, so increasing it can help to create a more relaxed state throughout the body. By relaxing the blood vessels and improving circulation, Nitric Oxide increases blood flow to the brain, lowers blood pressure and improves oxygen delivery to the whole body. Increased Nitric Oxide and relaxed blood vessels tell the body that it's in a state of relaxation, which encourages repair and rejuvenation. Nitric Oxide can also help to reduce the damaging effects of excess cortisol and other stress hormones. Secondary Uses: Ashwagandha helps boost vigour and vitality and has been shown to reverse several parameters related to aging. Nitric Oxide production begins to decline after age 40 but the body still responds to it when supplied through the diet. RejuveNOx creates the opportunity for the body to simulate a relaxed condition while improving performance, making RejuveNOx both an energizing and rejuvenating formula. It is ideal for those who feel old and tired or for those needing an extra boost to help balance a busy or stressful lifestyle.